Samsung adds Blinkbox movie streaming app to Smart TV platform | What Hi-Fi? Samsung has added streaming movie service Blinkbox to its Smart TV platform. The Blinkbox app will appear in Samsung's smart TV app store, Samsung Apps, and will bring a choice of over 9000 TV shows and films to any internet-enabled Samsung TV. Streaming content is available to rent or to buy, with charges on a pay-as-you-play basis with no need for subscription services. There is some free content available, too. Boasting "more content than any other UK movie streaming service", Blinkbox boasts classic titles and modern content alike – including Luther and Doctor Who – and promises to deliver many new releases on the same day they come to DVD. 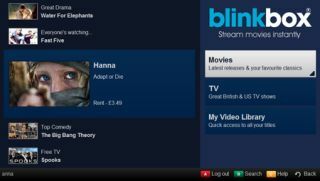 Blinkbox joins the likes of LoveFilm, BBC iPlayer, YouTube, Facebook and Twitter in Samsung's roster of Smart TV apps.